The setting of population targets is a much debated subject, particularly when talking about population control. One of the objectives of the International Species Management Plan (ISMP) for the Svalbard pink-footed goose is to stabilise the population. In order to realise this objective it was necessary to set a population target to aim for. 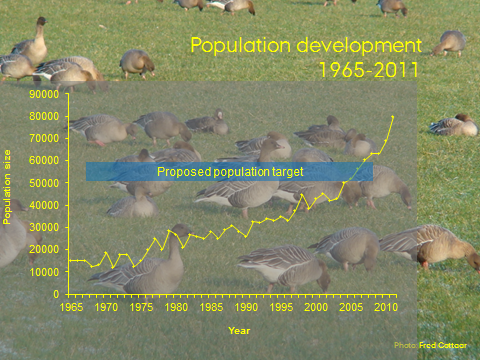 This was a new approach for waterbird management in Europe and little was known about setting or gaining agreement on such a population target. To help understand some of the issues and different stakeholder perspectives research was undertaken amongst a number of key decision makers. The article presents the results from this study and it is published on the open-access publication website, PLOSone.